For the longest time she was simply Sandy, from the 11th floor. At the time, her friendliness surprised me, although I know now that it should not have. 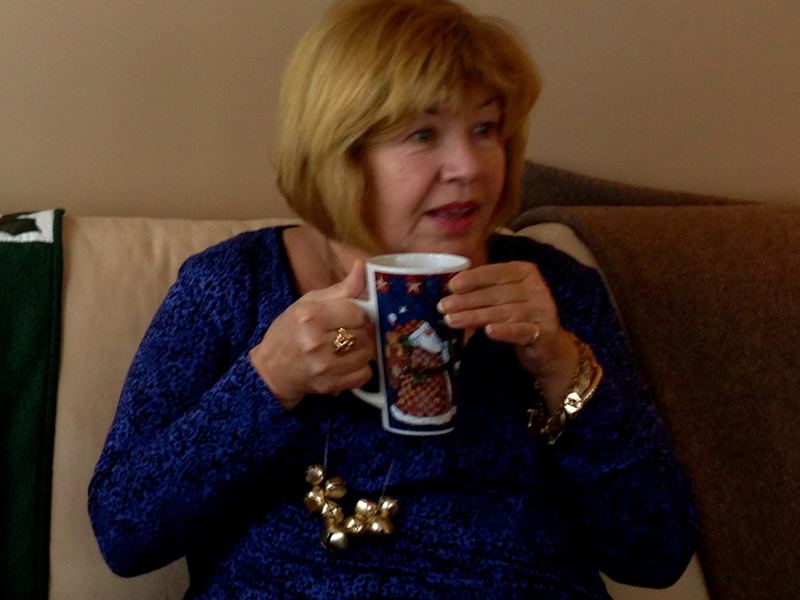 Sandy, looking glamourous as ever, in her Christmas morning pyjamas and sleigh bells, December 25, 2013. I had just moved to Toronto, trading a cosy and predictable life in small town New Brunswick for the vast and unknown terrain of Toronto. I’d sold my two story Cape Cod and purchased a two-bedroom condo, given up a tree-lined driveway for a subterranean parking space, exchanged seventeen flower beds for a couple of pots on a balcony. At least I still had a southwest view. I was confident something would grow. But I had no preconceived notion that growing anything would be easy, and least of all friendship. Who makes friends in a condo building, where every door in every hallway looks familiar and yet everything on the other side is clearly off limits? There are no windows in the doors to our suites for a reason. We live with the illusion that privacy is paramount. And so I was glad for Sandy’s gesture of friendliness that day. I even believed her sincerity. But I never made my way to the 11th floor. I just kept hoping I’d run into her again. “You should meet Sandy,” Kristi, my neighbour two doors down said to me many months later as we stood in our shared hallway. Kristi and I had developed a habit of hallway chats, sometimes leaning against the walls for 20 minutes, bundled in coats and boots, grocery bags at our feet. Hallways in condo buildings are sort of like garden fences in neighbourhoods. Both provide space for polite acquaintance. But you need to knock down fences and open doors to actually become friends. Kristi and I can both attest to that. “I think I already have,” I told Kristi, describing my encounter with the friendly woman whose thick blonde bob was as striking as her quick and ready smile. “Invite her to Monday night dinner,” I encouraged Kristi. And Kristi did just that. Rebekah, another friend and neighbour, initiated our Monday night dinner ritual not long after she moved into the building. Each week Rebekah prepares a feast and props open the door to her suite. Anyone and everyone is welcome to cross the threshold, to bridge the distance between stranger and friend. One evening, Sandy showed up, a glass of red wine already in her hand, an inquisitive twinkle in her eyes. She was quick to engage in the conversation, asking questions, telling us about her work at Toronto Sick Kids, how she’d moved to the Lake Shore seven years earlier, having downsized both a relationship and a house. That night I added Sandy’s number to my cell phone contact list using the same funny pattern I’d adopted since moving here. I’ve taken to identifying people by their first name and floor number. Last names take a while to discover. I don’t recall when I eventually added Sandy’s surname to my contact list. But the very fact I did is significant. As her name expanded, so did our friendship. Or perhaps it was the other way around. Monday night dinners were layered with conversations over tea on Sunday nights, coffee at Cocoa’s, a martini at Eden. And then, far too soon, it was over. Sandy died in January. It was sudden and absolutely unexpected; a complication from hip surgery that everyone, including Sandy, thought had gone extremely well. She was only 63 and she was eager to begin a new chapter in her life. An extended recovery vacation in Florida. Retirement. She had plans to invite the Monday night crowd to her place for dinner. I can’t quite believe she’s gone. It is as if a light has gone out in our building, and not one that anyone could turn on anytime soon. And yet, extinguishing a light as bright and generous as Sandy is not so simple. She’s left a spark behind. Because of Sandy, I’m friendlier to the people who stand next to me in the elevator every day. My relationship with any one of them could expand from stranger to acquaintance to friend. I know it’s possible. I’ve seen it happen. Such a beautiful tribute, Lynda! I’m sorry for your loss, but happy to be reading your words again. Thanks. Thanks, Rhonda. It took a while for the muscles to start working again! Loved reading your account of your friendship with Sandy, Lynda but I must admit it scared me a bit since I am 63 and awaiting hip replacement surgery later this year…Sorry for the loss of your friend!